Running places added stress on your knees and ankles, and in turn requires support from the ligaments in your body. Ligaments secure bones to other bones. Ligament groups affected while running include the cruciate ligaments, which connect your knee bone to your shin and thighbones. Additional ligaments connect the ankle bones to your shin bones; a sprained ankle results from stretching these ligaments too far. Recognizing and preventing ligament tears and stretches can help you stay healthy while running. Most ligament injuries due to running occur from twisting in the leg. Planting your foot in a pothole or slipping on an uneven surface can twist the ankle or knee, resulting in an anterior cruciate ligament — ACL — injury. This ligament is responsible for giving stability to the knee, the UpToDate website explains, which is why it is easily injured in runners. Poor running form also can contribute to a ligament injury, particularly if you run with the legs slightly inward. Medial collateral ligament — MCL — injuries are less common in runners because the injury most commonly results from an outer impact to the joint. However, overuse through frequent running can aggravate a past injury and cause pain. Injuries to your ACL are characterized by hearing a "pop" in your knee. You may not initially experience pain, but within a few hours of injury, your knee will likely swell and may be painful to move. The knee may feel unsteady, as if you are having trouble supporting your weight. Injuries to the ankle ligaments — ankle sprains — are characterized by swelling, pain and inability to support your weight. Dependent upon the severity of the injury, MCL injuries are characterized by swelling, tenderness and pain at the knee, the Stretching Institute website notes. 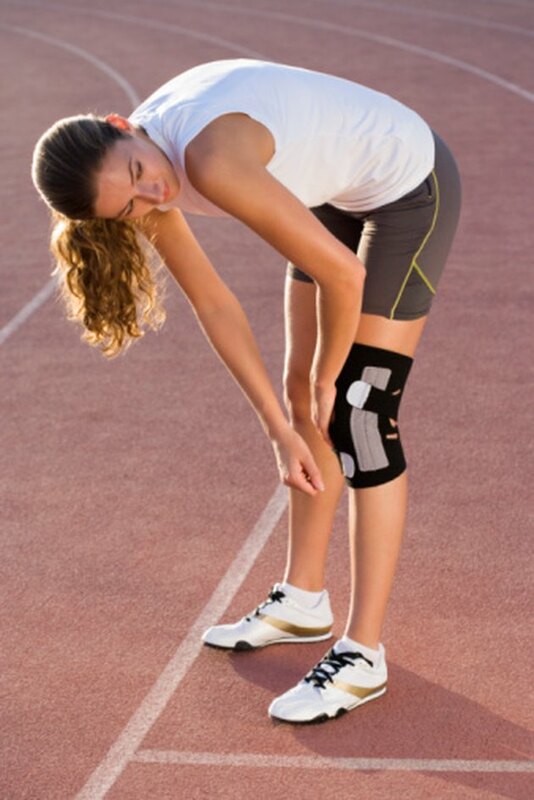 Ligament tear prevention requires you warm up properly to prevent excessive tearing or stretching of the ligaments. Walk at least five minutes before running, then stretch the leg muscles to loosen tight ligaments. Always wear supportive shoes, replacing them every 300 to 500 miles. Rest your muscles between running sessions, allowing the ligaments time to heal. Alternate your running sessions with low-impact activities, such as cycling and swimming. This will place less strain on the ligaments. If you think you have experienced a ligament injury, use the RICE method — rest, ice, compression, elevation — to heal the affected ligaments, the NetDoctor recommeds. Rest, staying off the leg to avoid placing excess strain on the joints. Icing the affected area helps reduce swelling while compression, such as wrapping a compression bandage around the knee or ankle, can reduce swelling. Elevating the leg can encourage blood to flow back to the heart. If the injury does not respond to over-the-counter treatment, seek medical evaluation. In the case of severe ligament injuries, your doctor may recommend surgery.